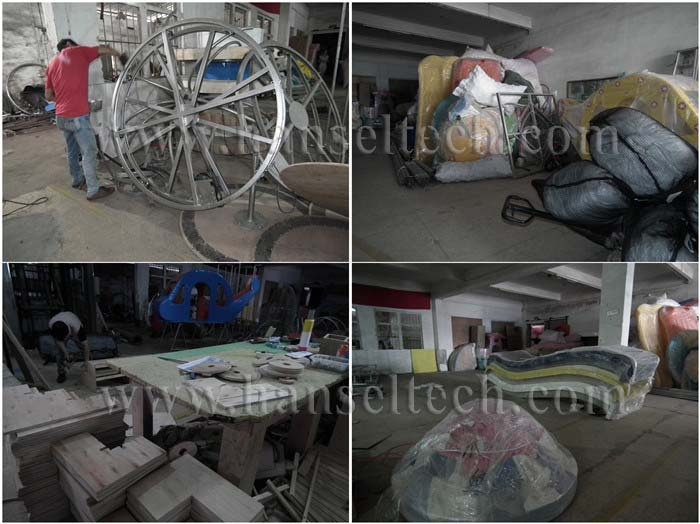 Welcome to visit Hansel website :-)Children Soft playground is one kind equipment which is for kids' entertainment. We can also call it kids indoor playground,soft indoor playground, indoor playground equipment for sale, children play house, children maze,indoor play center, indoor playground equipment, children indoor play maze, children soft play center, indoor soft playground, kids soft play area, naughty castle, children indoor soft playground, amusement park soft playground equipment, kids soft play center, kids amusement center equipment, etc. It is new with various attractive amusement items for kids. The kids can drill, climb, slip, roll, shake,rock inside. Children can develop independent personality, do exercise and to be more active with indoor playground equipment, soft playground equipment ,children indoor play structure. There is no limits of space for soft playground. It can be both indoor and outdoor. It is also suitable for non - regular place. It is a kind of investment with easy management and fast profits. 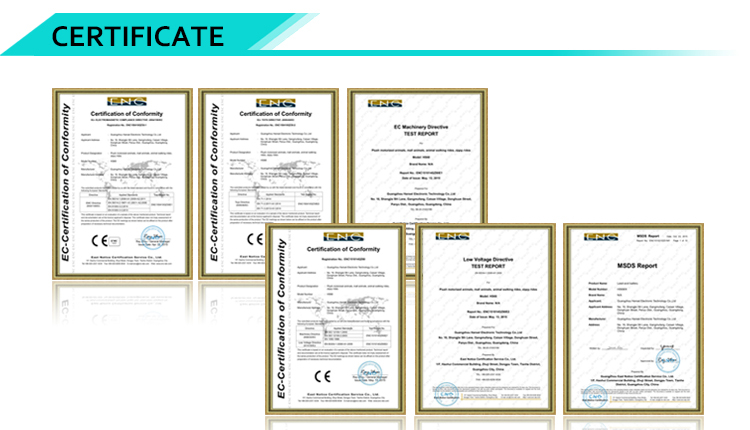 The main material is engineering plastics, PVC, galvanized steel pipe frame, steel pipe, sponge, wood. The main components : Giant wave slide, ball pool, fun battle area, gun shooting, tunnel , jumping bed, adventure bridge, etc. 1. What are kid’s naughty castle /kid’s playground? Indoor playground is one kind of soft playground . 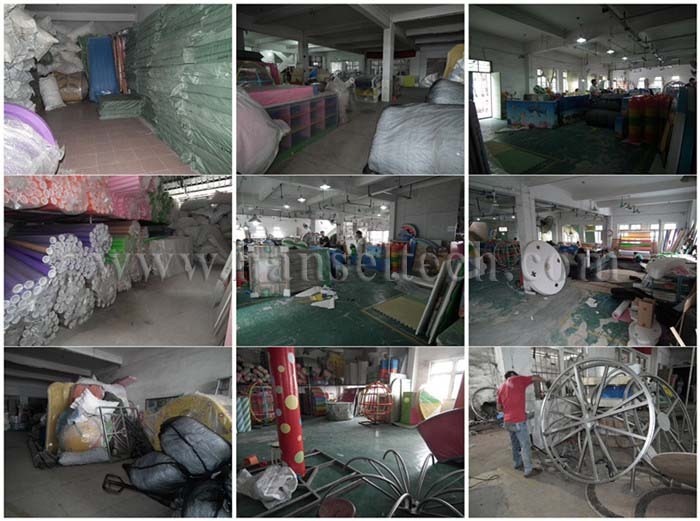 We can also call it indoor playground, soft playground, children play house, children maze, etc. It is new with various attractive amusement items for kids. The kids can drill, climb, slip, roll, shake,rock inside. Children can develop independent personality, do exercise and to be more active. Every parent wants to give their kids a happy childhood. Please do not miss the good chance to set up a happy paradise for kids, also for you to make long term and stable profits. 2. 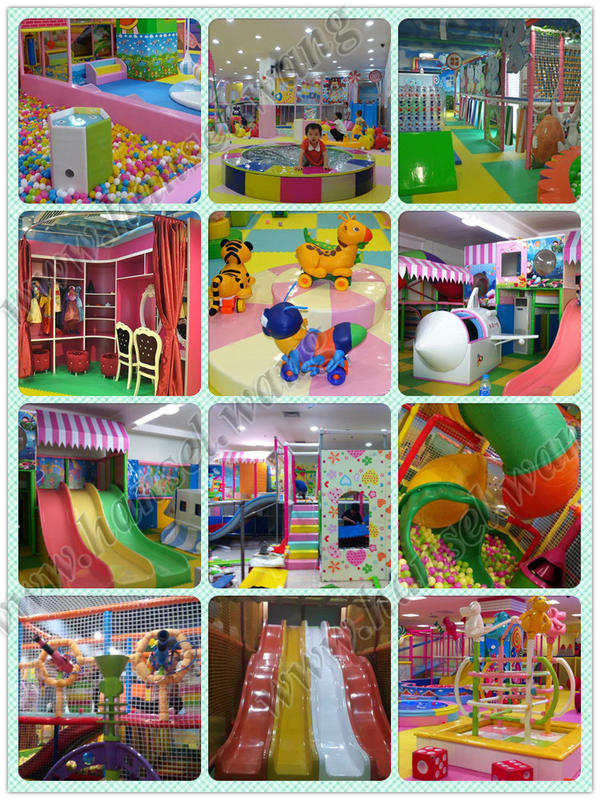 Which kind of indoor playground Hansel can offer? 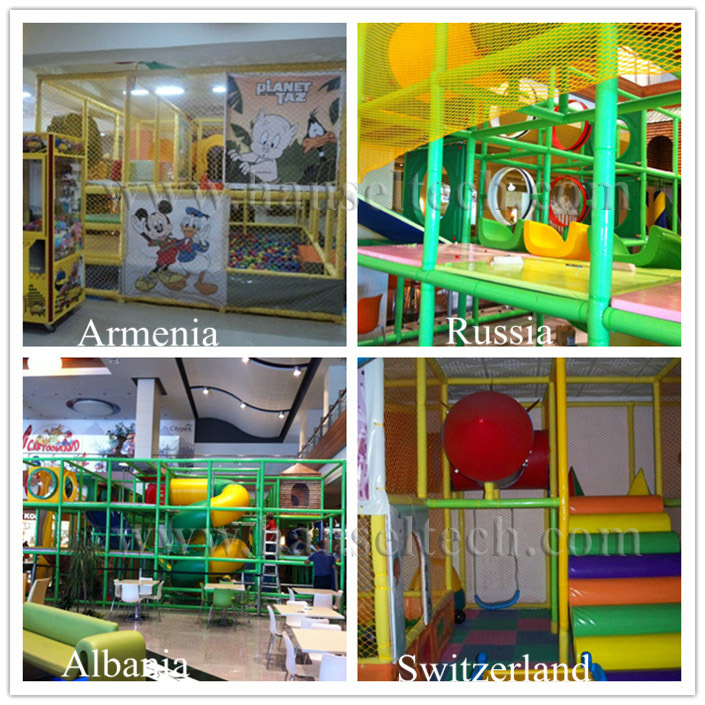 Our indoor playground enjoys good reputation from clients in different countries like Sweden, Armenia, Burma, Romania,Russia,Chile,etc. A.length, width, height of your place,the location of the entrance. B.the location and size of the pillars if there are. supermarket, commercial center, KFC & McDonald s’ restaurant, family, shopping mall, shopping center, game center, amusement park, etc. 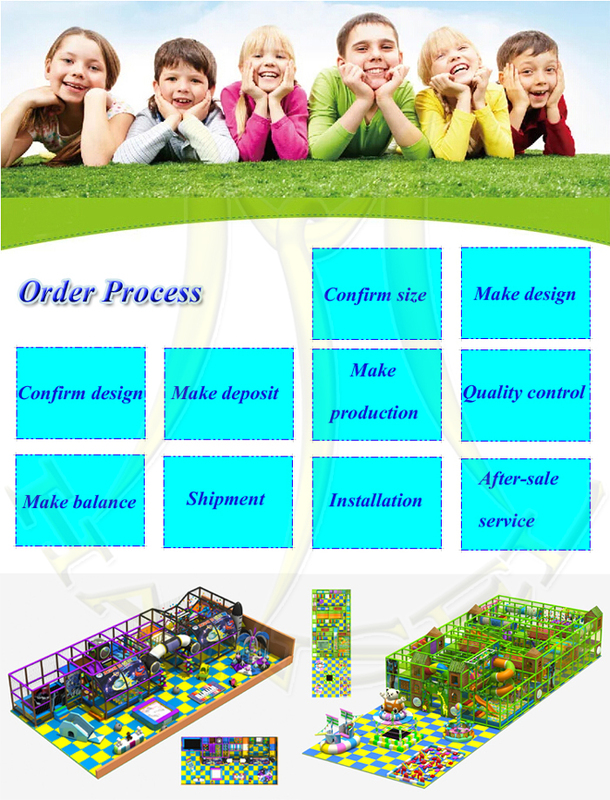 7.How to Customize an indoor playground? ---playground safety rules: Wait the turn; go down the slide feet first; hold on to railings and sit down on swings and slides. ---keep clear of moving swings and the bottom of slides. --- remove helmets, scarves and drawstrings, avoid playing with skipping ropes around the equipment. ---It should have a deep, soft surface as well as handrails and barriers to prevent falls. Watch out for sharp objects or spaces where the child's head could get stuck. Remark : The designs and inside types are customized. We have professional design team. How to Customize an indoor playground? 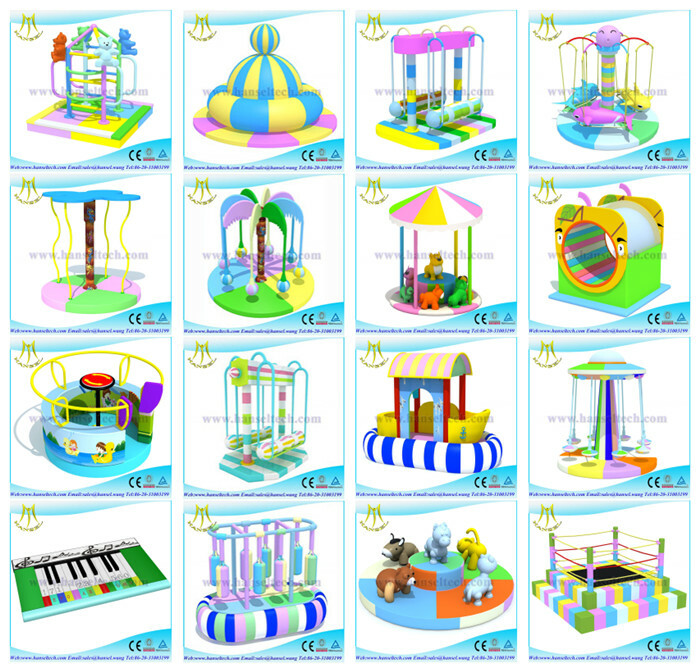 There are various designs with different themes such as Ocean theme soft indoor playground, jungle theme children playground equipment, candy theme playground for girls, Space theme naughty castle. etc. Three types of soft playground. The most commen one is traditional naughty castle, the second one is electric soft playground, the third one is traditional naughty castle with electric playground items.